It is well known that differences in health and wellbeing within and between populations are influenced by a range of biological and social factors. However, less attention has been given to identifying how differences in these factors may influence the experiences or outcomes of prevention work. Prevention interventions and policies may also inadvertently generate health and social inequalities by disproportionately benefiting some populations, to the disadvantage of others. The development of frameworks such as PROGRESS Plus (Place of residence, Ethnicity, Occupation, Gender, Religion, Education, Socio-economic status, Social capital, Age, Disability and Sexual Orientation) has helped to provide a focus for research, but how do these factors influence intervention outcomes, and how do we design prevention policies and programmes which take them into account? 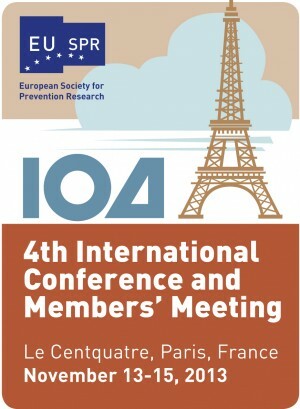 The 2013 EUSPR Conference focused on the important role of modifiers of prevention outcome, and examined the best ways in which diversity can be incorporated into research and practice. Keynote speakers presented the latest findings from research investigating modifying factors such as age, gender, ethnicity, family and socioeconomic status. We are also extremely pleased that pre-conference workshops were held in collaboration with the Science for Prevention Academic Network (SPAN) project, which aims to support the development of prevention science education across the EU. As part of Day 2 of the conference there was a special guided poster session with prizes for the best Early Career Posters including cash prizes and one year’s free Society membership. The poster prizes were supported by SPAN. Please see the links below for the programme, a summary of the conference, the conference flyer and the conference booklet. Our 2013 conference was co-organised with INPES (Institut national de prévention et d’éducation pour la santé; French Institute for Prevention and Health Education), MILDT (Mission interministérielle de lutte contre la drogue et la toxicomanie; Interdepartmental Mission for the fight against drugs and drug addiction), INCa (Institut National du Cancer; French National Cancer Institute), IReSP (Institut de Recherche en Santé Publique; French Institute For Public Health Research) and Aviesan (Alliance nationale pour les sciences de la vie et de la sante; National Alliance for Life Sciences and Health).